I felt like The Bird of Paradise, because I was in paradise! There’s no other word to describe the wonderland that made my heart grow wings and soar. 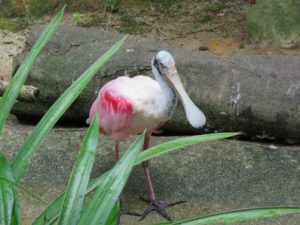 I was at the world-famous Jurong Bird Park, Singapore. My legs were on autopilot, leading me to the Pool Amphitheatre, where I perched at a vantage point. I watched the High Flyers show presented by nature. 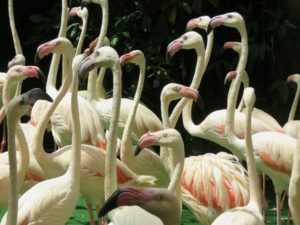 It started with a parade by Scarlet Ibises, Pelicans and supermodel-like Pink Flamingos. 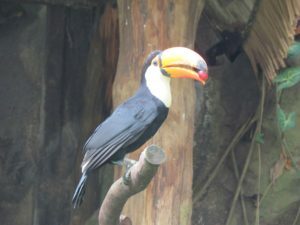 Then a Toco Toucan appeared out of thin air and performed incredible aerobatics. My attention was stolen mid-show by Macaws that seemed to be drenched in poster colours. Mother Nature had painted them scarlet, blue and yellow. They put up an energetic show that rivalled the FIFA World Cup. Then, the family reality show began. 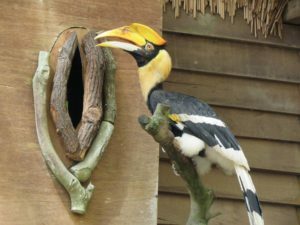 The Indian Hornbill was the star of the show. He fed his ladylove and chicks in a beautifully constructed nest. Then, a yellow crown stole my attention. 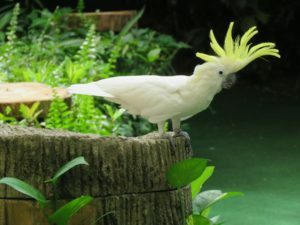 It belonged to the Sulphur Crested Cockatoo, which put up a splendid performance. I silently applauded so as to not disturb the winged beauties. I walked past the Flamingo Lake and the Pelican Cove, where the birds were making a splash, pun intended. Then, I reached Parrot’s Paradise, where gorgeous parrots were visiting from all over the world. Parrot calls echoed in my head and the hues of their wings coloured my imagination. 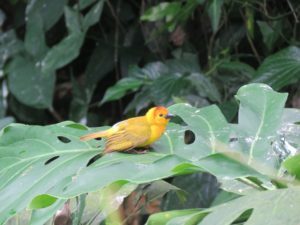 It stayed with me even as I moved on to the Waterfall Aviary. I was mesmerized by the song of the gurgling waterfall pouring into a clear stream. It seemed to be a popular hangout spot for birds. One of them was in quite a serious mood though. 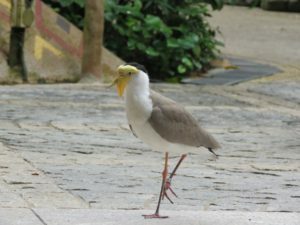 He was the Masked Lapwing, looking like a martial arts monk waiting for his students. Then, a streak of glossy blue and copper flashed passed me. 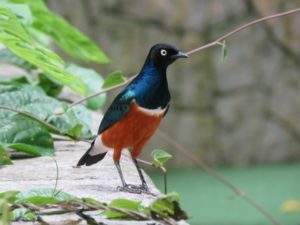 It was the Superb Starling, every inch a star. The Small Blue Kingfisher got jealous, though it had no reason to. It launched into a quick flight and disappeared. Perhaps, it was forking out a fish somewhere. I missed that sight, but it was amply compensated by the Roseate Spoonbill, who expertly caught fish and displayed an impressive dining etiquette. Then, I suddenly heard background music. The musicians were rosy cheeked Baya Weavers building their nests behind long blades of grass. A stack of huge eggs caught my eye. It turned out to be an installation on top of a rock that had the words ‘Dinosaur Descendants’ engraved on it. It piqued my curiosity and I gravitated towards the winged cousins of the Jurassic giants.I met Grey Crowned Cranes, Ostriches and Emus. They craned their long necks and stared at me with curiosity. Then they walked off on their long, model-like legs and went about their daily routine. Then, I headed to the Lory Loft, where a flock of lories had gathered together, flapping their wings, resembling a team of rugby players trying to grab the ball. I found that they were clamouring for sugar syrup offered in a bowl. After they had their fill, I managed to get a selfie with them. Then, something perched on my head, like a crown. It was a Rainbow Lory that seemed to think my hair was a nest. I felt like placing it my shoulder, like a baptized Jesus, but it flew away. I stepped out of the Lory Loft and entered the Heliconia Walk. I was welcomed by thousands of cheerful red heliconias. A magic torch heliconia showed me a path to wonderland, which I followed with childlike curiosity. 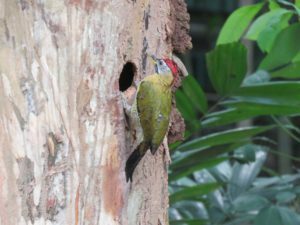 My curiosity was fulfilled by a male Laced Woodpecker wearing a moss green suit and a red crown. He was busy carving a one-room home in a tree. 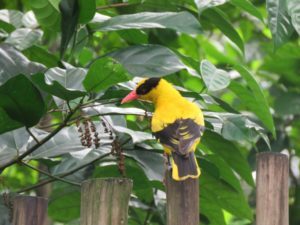 He was being watched by a Zorro-like masked Black Naped Oriole perched on a wooden fence. Perhaps, the Oriole had finally found his Catherine Zeta-Jones, with a house ready for them to move in. I had feasted my eyes on birds in every imaginable colour, and I wished to see some black-and-white birds for a change. Where else would I head but the Penguin Coast? 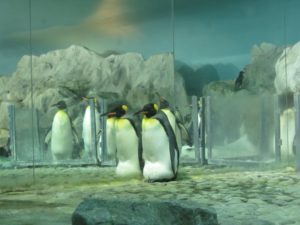 This artificial setup doubled up as a ramp where adorable penguins waddled around. I bid goodbye to the penguins and literally flew to the Hawk Café, where I perched on a chair and enjoyed a cappuccino. Then I stepped into the souvenir shop where it seemed as if Santa had upturned his sleigh. The shelves were brimming with t-shirts, merchandised dolls and games. 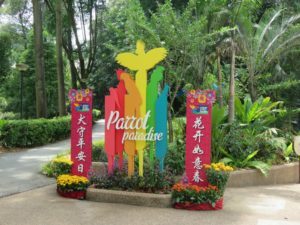 I filled my shopping basket with delightful memories of Jurong Bird Park to take back home. As I reached the exit, I looked at the signboard and said, “So long, Jurong!” But my heart hasn’t flown home with me. I can’t wait to meet my winged buddies again! I always enjoy reading the posts on this page. It gives a clear picture what to look out for when we are visiting a certain place. 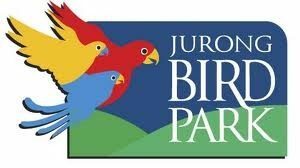 A nice guide for avid bird watchers. 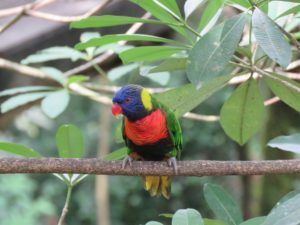 This post was an enjoyable read with the pictures of the colorful birds. 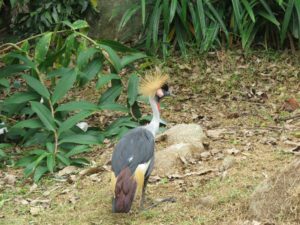 Even without visiting the Jurong bird park one can still live the moments with these vibrant pictures. Thank you so much. Sure, will come up lot of interesting nature trails in the future. Colourful 👌 nice collection of pics n information about paradise . That was an interesting and a very informative post. Also, Lovely pictures that brought out the beauty of those birds. 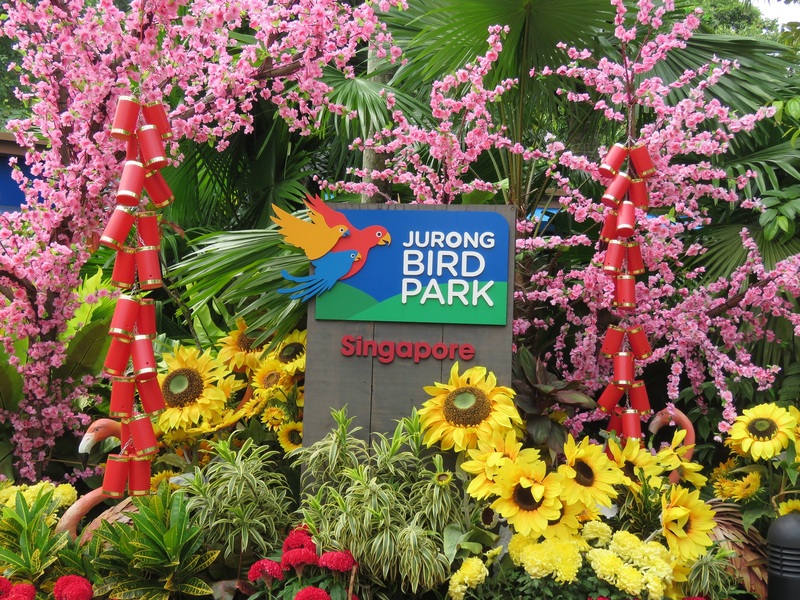 Adding Jurong bird park to my bucket list!